This kind of ball has what they call sun figures, which came from Siberia. The circular decorations on this kickball, applied in polar bear fur, represent the sun. The design comes from Yupik clans living on the Siberian coast. Estelle Oozevaseuk suggests that the sun design might be connected with spring whaling ceremonies. Aron Crowell: It says [museum catalog information] made by Genevieve Apatiki. Estelle Oozevaseuk: Oh, my sister. This is a modern one. 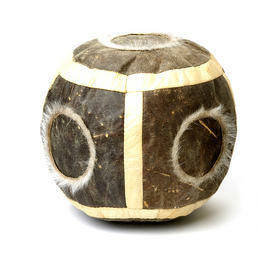 This kind of ball has what they call sun figures, which came from Siberia. They used reindeer mane hair. We cut them and just by stitching we make a good sun here with something inside. And nowadays I use polar bear skin. It’s good because it’s not too soft like seal skin. The hair is supposed to be all around in one way, because we never sew it with skin part on. We just use a few hairs and then sew it on. And then one should be there and then that way [all going the same direction]. Aron Crowell: What sort of leather is the whole ball? Estelle Oozevaseuk: That is shaved sealskin. Aron Crowell: Is the white bleached seal skin? Estelle Oozevaseuk: Yes, bleached seal skin. Some of them are much fancier than that with smaller patchwork on it. And it took a long time to make them. Also trying to make it round like that is for starters is hard, because we do it without a pattern, just from here [memory]. Aron Crowell: Why is the sun [design] on there? Estelle Oozevaseuk: I don’t know. That’s a pattern from Siberia. I was wondering about that too, why they always use the sun. Is Siberia connected to others that worship the sun? Maybe they have known about that and so they use the sun design on there. Branson Tungiyan: It’s surprising also that today, their dance group is called the Sun Dancers and they’re from New Chaplino [place name in Chukotka]. And it probably has to do with something from way back, that has to do with the sun. Estelle Oozevaseuk: Sometimes I thought about trying to find that [out]. As you know, that whaling ceremony [the spring offering called Ateghaq], maybe that came from Siberia too with our tribe [clan]. They wait for the sunrise. When the sun comes, they start it. 1. This ball was discussed along with ball E280256.